The Cameron C[ompanies?] claim "Camerouton" Williams Creek, B.C. 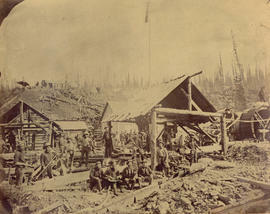 Photograph shows John A. Cameron, known as "Cariboo Cameron", with mining equipment and structures.